There are the things seen with the eyes, physical realities: assorted shapes, diverse patterns -- some repeated as themes over a variety of individual rug pieces; multitudes of colors and color combinations blended in harmonious ways that give a vitality to the patterns delineated by their changes and juxtaposition. And these visual impressions expand beyond mere physical sensation to metaphysical considerations: the things seen with the mind's eye. I see the complexity of structure and form that suggest (undeniably) an enduring purpose, things built to last; like any work of art: an artifact of creation that extends in time beyond the creative act as a testament of the spirit that created. The amazing intricacy, the lively interplay of colors and patterns are beacons radiating here and now the vitality (and apparent delight in life) which in reality are temporally and spatially distant as regards their use in the effort of assembling them into these expressions of beauty. An artisan, or group of artisans, far removed from here in some distant land and different culture, working for a long time in some time past, brought forth with the labor invested in each unique rug a testimonial, a monument, a memorial perhaps to a great love, or some deep appreciation, or an enviable ecstasy that had the inner power to shape spiritual motives into physical reality. 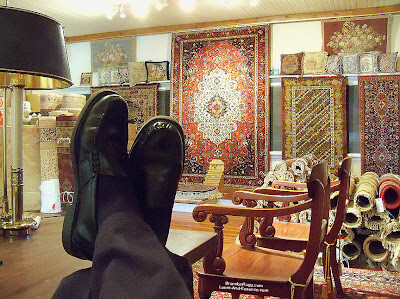 I know the simplicity of the people who have made these finely crafted rugs that I see with my eyes from my desk. Their hard lives and simple ways don't hold much attraction as a "lifestyle choice" for us when compared with our easier "sophisticated" Western lifestyles; but the physical artifacts of their spiritual life-force -- full of color; intricately interwoven in beautifully patterned themes -- deserve respect, appreciation, and some effort at integration into our speed-of-light material culture which is less and less connected with artisanship and the ability therein to personally transform our spiritual urges into enduring symbols of what truly motivates us. Our customer had been working with her designer on redecorating her living room for several months. From the outset she had decided she wanted an area rug to anchor the room, and unify all of the furnishings and colors she was selecting. 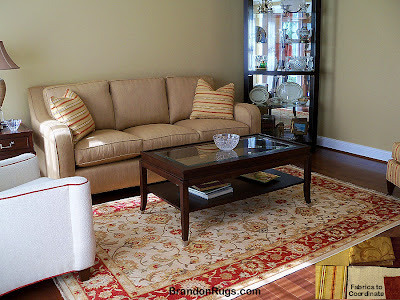 The room was nearing completion - her new furniture had been installed - and she was still without a rug when, via our website, she found Brandon Oriental Rugs in Bucks County, Pennsylvania and decided to see if our Rug-Search(TM) service could accomplish what she had been unable to do herself. We also learned from her in the process that the REAL hand-knotted rug she selected from Brandon Oriental Rugs was more reasonably priced than many of the choices that had been suggested to her previously. She is also delighted with the fact that she has a REAL rug (not some machine-made or "tufted" imitation) giving her the quality and value that is important to her - as evidenced in all of her tasteful decorating decisions. Though we are proud of the visible demonstration that our store makes of the magnificence and enduring qualities of REAL Handmade Rugs -- and of our commitment to offering the same to our customers -- Brandon Oriental Rugs is NOT just a store, we are a service. Those shopping for rugs who take advantage of the unique benefits our Rug-Search(TM) service offers will save time, effort, and cost in their acquisition of fine handmade area rugs. Brandon also offers complimentary design assistance related to rug selection and use with professional evaluation of the wants and needs of our customers in consultation with them and/or their interior designers or architects. Other complimentary services (including free local delivery and in-home trial of multiple rugs) are offered to make rug-search and selection an enjoyable process. 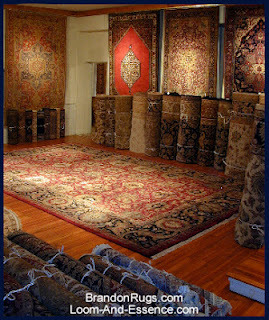 Additional services associated with fine handmade rugs (including professional rug cleaning, rug restorations and repairs, and rug appraisals for purposes of estate protection, insurance, and loss evaluation) are also provided by Brandon Oriental Rugs. We take pride in being "The Home of REAL Rugs"(TM) because, regardless of where you choose to make use of them, "REAL Rugs Bring Pride to Every Room"(TM). Whether you are an expert or a novice in the use of REAL, hand-knotted rugs, Brandon Oriental Rugs works to advance your appreciation and experience of all that is of significance to you in your special rug search. Our resources are available to you to help you realize your goals, and to assure you the enduring pride and satisfaction experienced in achievement.